After winning two of three on the road last weekend, the Ottawa 67’s will be the visitors once again on Wednesday night as they visit the North Bay Battalion for the first time this season. 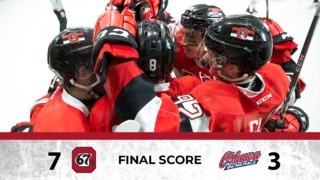 Though Ottawa dropped their opening game of last weekend’s trip against Kitchener, the club bounced back in a great manner with two dramatic wins over Owen Sound and Hamilton. 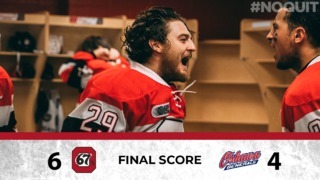 Noel Hoefenmayer’s goal gave the 67’s the win in the game’s dying minutes over Owen Sound, while Tye Felhaber scored only 9 seconds into overtime against the defending OHL champions Hamilton Bulldogs to close out the trip. Ottawa now sits second in their division with a 3-2-0 record. Four teams, including the Barber Poles, are tied for the Eastern Conference lead with 6 points in the standings. Austen Keating leads the team in points with 7 (2 goals, 5 assists), while Tye Felhaber has already put up 4 goals in 5 games for the 67’s. North Bay finished 6th in the Eastern Conference last year with 69 points, the same as the 67’s. While they may not have gotten off to the start of the season they would have liked, the team still counts on a number of veterans that were with the club last season, including 20 year old Justin Brazeau, who had 39 goals and 75 points last year. He is now tied for second in the OHL with 5 goals this season. Other veterans of note that are back with the Battalion are Matthew Struthers, who has put up 7 points in 5 games so far this year, and Brad Chenier. In nets, North Bay are all set with veteran Christian Propp in the cage. Propp had a great year for himself last season, finishing with a .910 save percentage and a 2.81 goals against average in 35 games played. The Battalion will look to get back on track as they have lost their last four games, while being outscored 26-8 during those four losses. In the four games both teams played against each other last season, Ottawa won three and North Bay only one. Ottawa’s last regular season game last year was a 5-0 win over the Battalion, a game where Tye Felhaber had two goals and an assist. Felhaber has twice scored the first goal of the game this season, a stat where he is tied with two other players for the league lead. Noel Hoefenmayer is currently on a three-game point streak. The defenseman had a goal and three assists during the teams’ three-game road trip over the weekend. 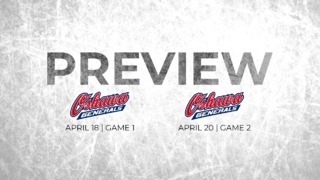 Rookie goaltender Will Cranley started his first career OHL game in Owen Sound on Saturday. The 16 year old goalie got his first win, stopping 41 shots.